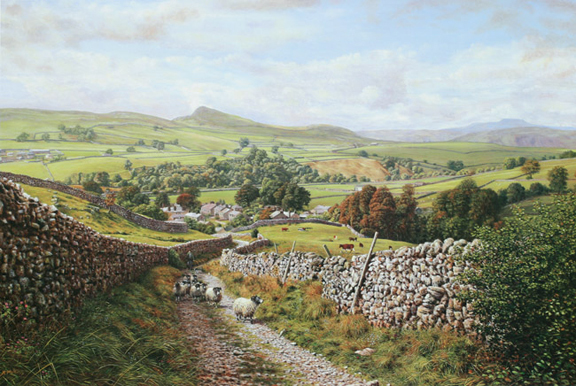 The Yorkshire Dales is one of the most stunningly scenic regions of the British Isles. 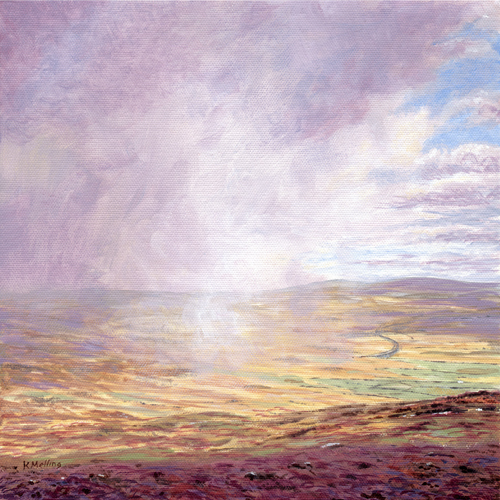 Here on this page is a comprehensive range of evocative Yorkshire Dales prints from the paintings of Keith Melling. 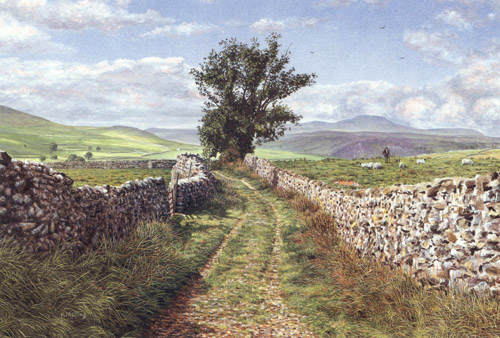 This green lane, which starts in Horton-in-Ribblesdale, is a very scenic and popular route to the foot of Pen-y-ghent, where it becomes a footpath passing several interesting features on the way to the summit, a small diversion leads to the huge gash of Hull Pot and another to the fearsome Hunt Pot. 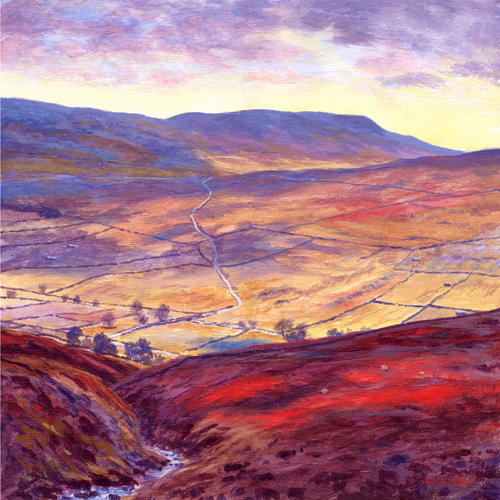 Looking up the dale towards Gunnerside, the viewpoint of this landscape painting is by Birks House on the easterly moor road 'ower-top' to Wensleydale. 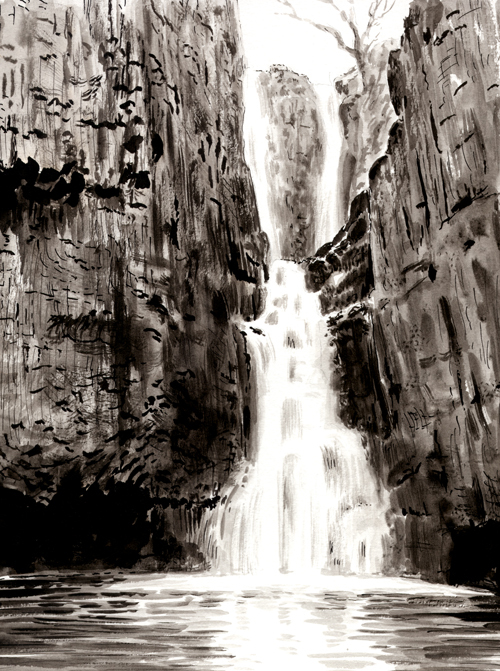 Swaledale is, in my opinion, the most dynamic and dramatic of the Yorkshire Dales because of its narrowness. 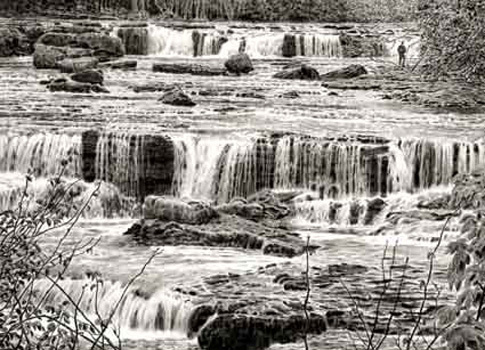 The River Swale is said to be one of the fastest flowing rivers in England. Horse Head Pass rises out of Halton Gill in Littondale and goes over the fell to Raisgill, Langstrothdale. Hawes is set at the head of Wensleydale with breathtaking scenery all around and happens to be one of the highest market towns in England. 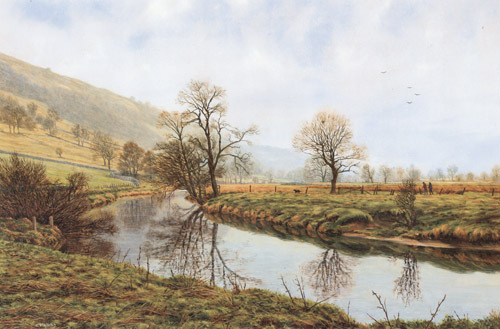 The River Ure (the dale was formerly called Uredale) shown in the painting, is such a picturesque feature of Wensleydale; it runs just to the north of the town. 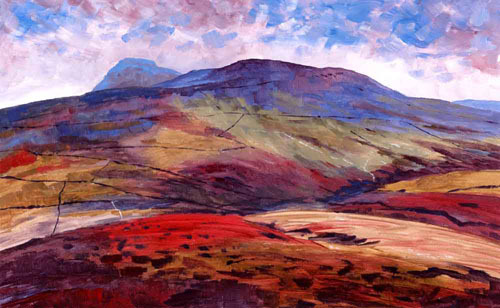 There are many good walks from Hawes, this painting is viewed, more or less, from a footpath going to Sedbusk. Looking down Goat Scar Lane to the characteristic Yorkshire Dales village of Stainforth, Smearsett Scar is prominent in the background with Ingleborough on the far distant right. 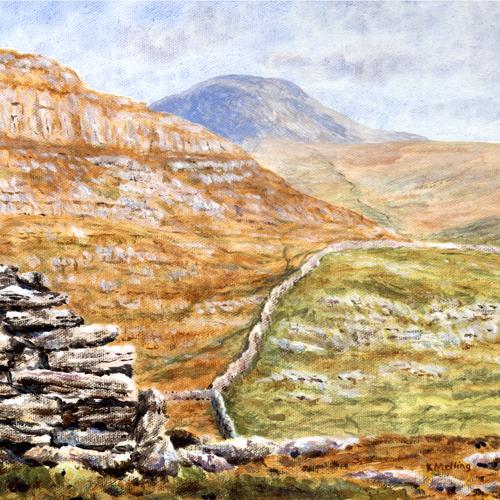 The dry-stone walls, mostly limestone, are typical of the Yorkshire Dales. The road, railway and River Ribble run useen through the scene. Beautifully situated by a tranquil stretch of the River Wharfe, Burnsall is one of the most visited villages in Wharfedale and perhaps in the Yorkshire Dales. 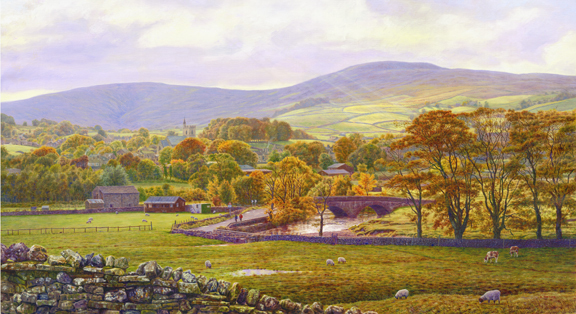 This painting shows the well known panoramic view of Burnsall in its lovely setting with the handsome stone-bridge prominent, from a vantage point on the Bolton Abbey road. 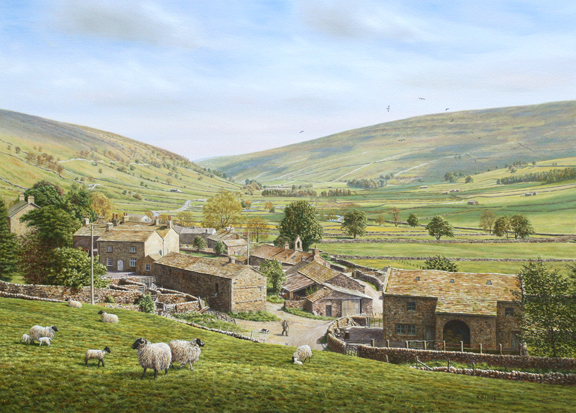 This was the first of my Yorkshire Dales paintings and remains a firm favourite. The view is looking south from Top Mere Road, over the glaciated 'U' shaped valley of Wharfedale, towards Grass Wood and Grassington. Kilnsey Crag can just be seen in the distance behind the fell on the right. In the heart of Swaledale, this iconic Yorkshire Dales village holds a commanding position at the foot of Kisdon Hill. 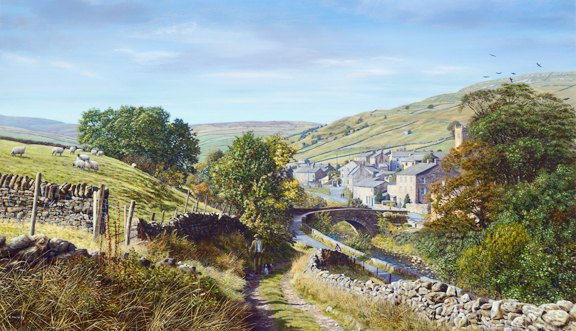 The view in this painting is from the track that crosses Straw Beck. 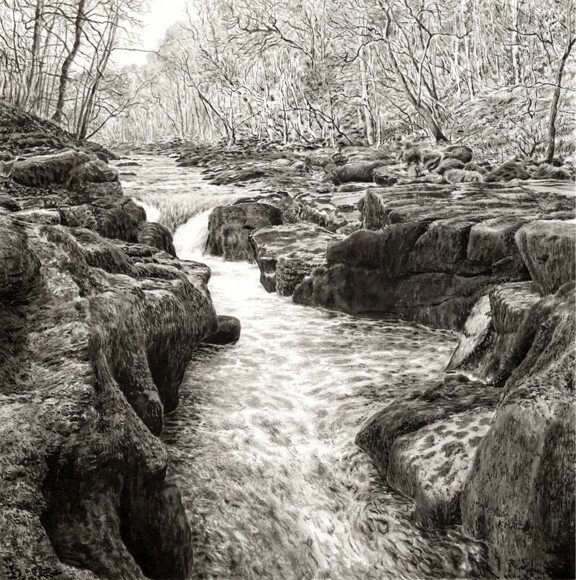 The waters of this beck join the River Swale nearby. 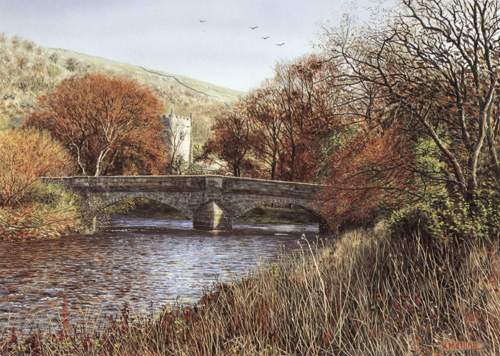 The viewpoint of this landscape painting is by the River Wharfe near Grassington in the Yorkshire Dales… actually nearer to the little suspension bridge at Hebden, where the river is accompanied by an assortment of beautiful mature trees; mainly horse chestnut. There is a popular walk along here from Burnsall to Grassington, which is part of the 'Dales Way'. Looking down Nidderdale from the elevated position of Middlesmoor with Gouthwaite Reservoir and Ramsgill in the far distance. 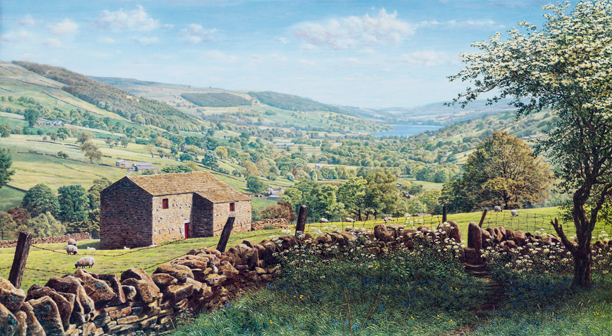 This Dales painting shows clearly the glaciated 'U' shaped valley of Wharfedale. 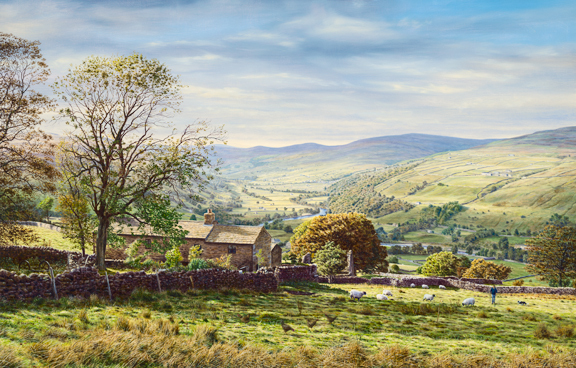 The view from above Starbotton is quite similar to the composition of my Above Kettlewell painting but even more extensive. Often this track (properly Walden Road) is used as the descent from Buckden Pike. 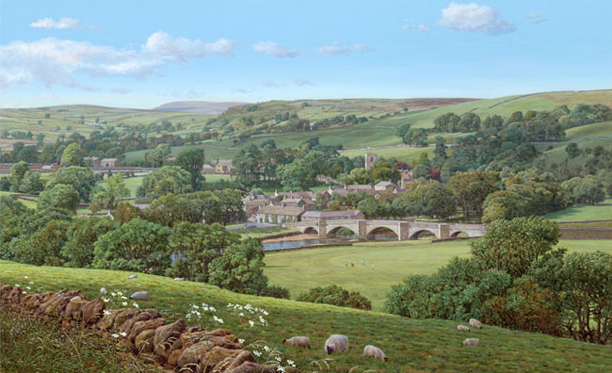 This painting from the moor road looks over the rooftops of Askrigg across the dale to the lofty Addlebrough. Addlebrough is one of the lesser known fells in the Yorkshire Dales - yet from this angle appears quite spectacular - not unlike the fells of the Three Peaks in shape. 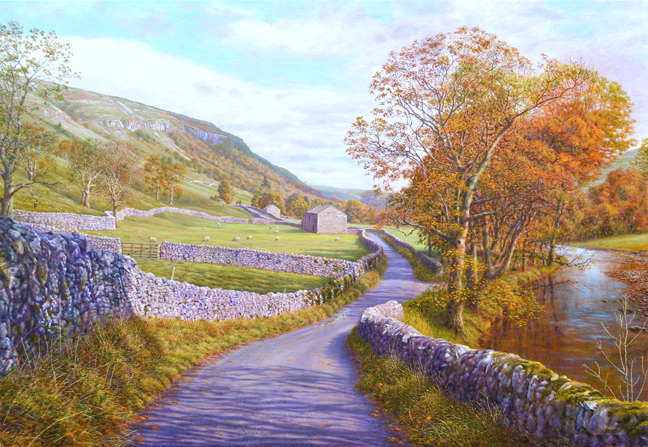 The narrow road, accompanied by the meandering River Skirfare, runs from Arncliffe through Hawkswick to Wharfedale. Limestone is in evidence wherever we look, not only naturally on the fell sides with scree, scars and crags but in manmade structures like the little field barns and miles of old dry-stone walls. There's no mistaking the season here; it's autumn and probably the height of that colourful time, which is usually the end of October and beginning of November. 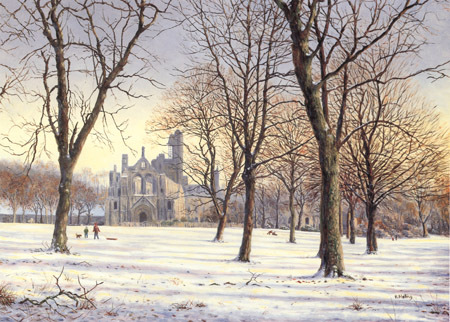 Although it doesn't dominate the scene, Bolton Abbey (properly Priory) is the focal point in this painting. 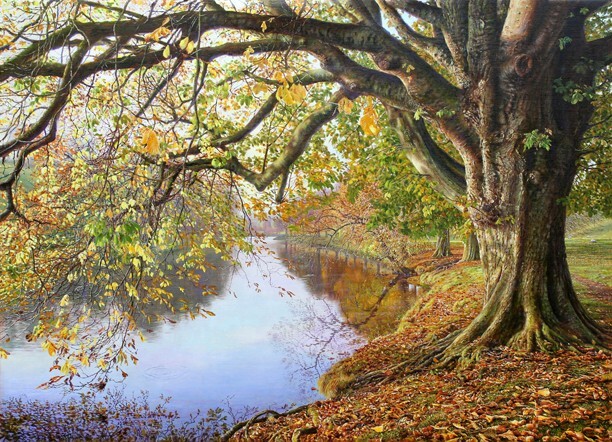 The viewpoint here is looking up-river on the banks of the River Wharfe. 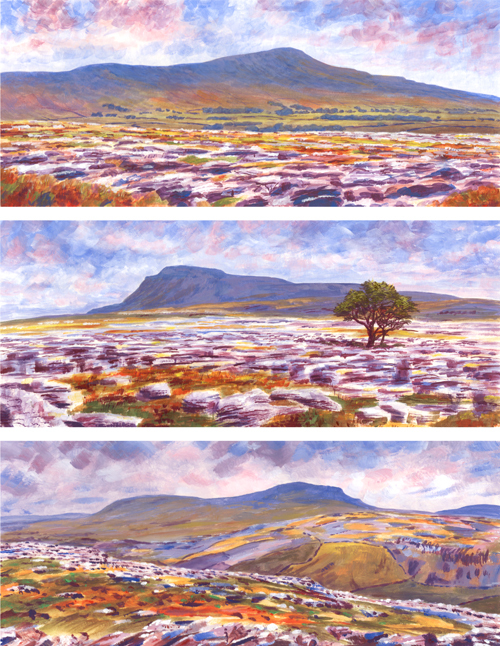 The Three Peaks: Whernside, Ingleborough and Pen-y-ghent (in order of height) are perhaps the best known mountains in the Yorkshire Dales. 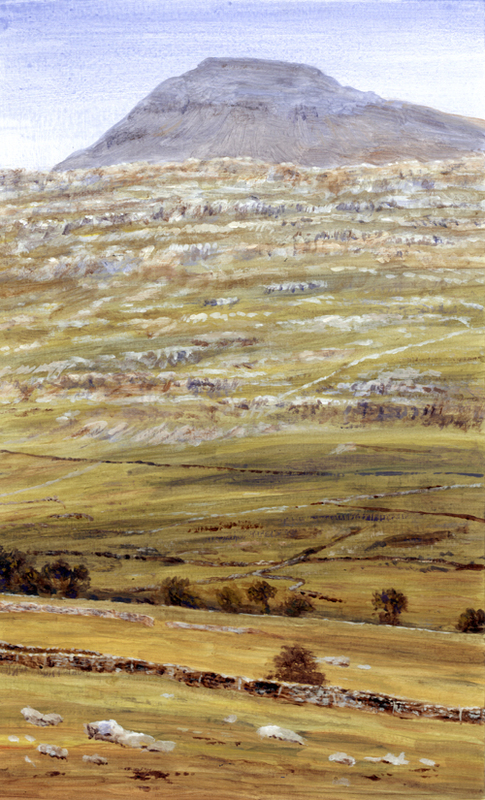 In this painting (or three paintings), Whernside is shown from Black Shiver Moss, Ingleborough from White Scars and Pen-y-ghent from Norber. 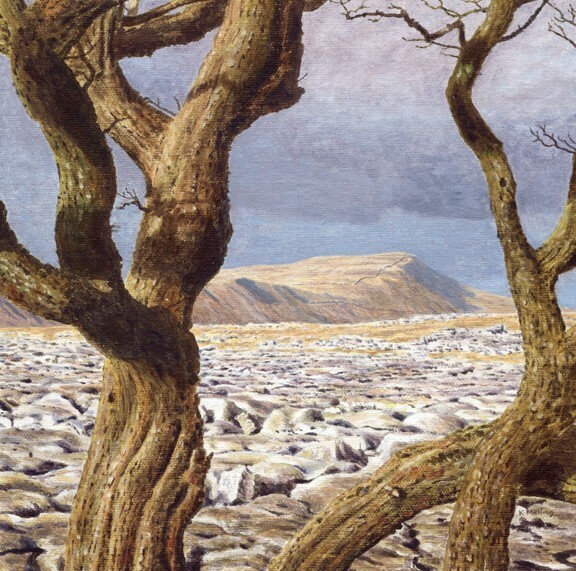 Although Whernside has been proved to be the highest, Inglebourough, always seems higher... probably something to do do with its shape. 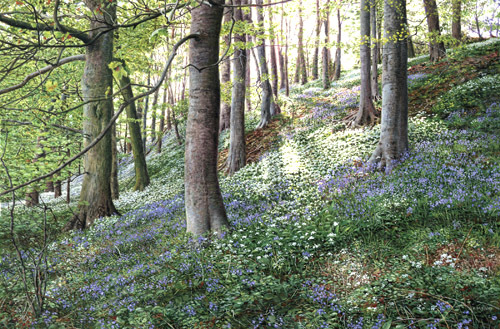 This wood just by the River Ribble near Langcliffe is typical of many bluebell woods in the Yorkshire Dales and for that matter in England. Ramsons (wild garlic) grow quite happily among bluebells. 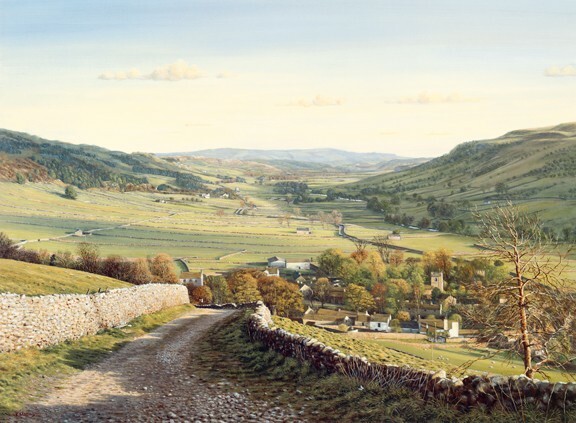 Lovely Littondale which is a side valley of Wharfedale probably hasn''t changed much in appearance for hundreds of years. 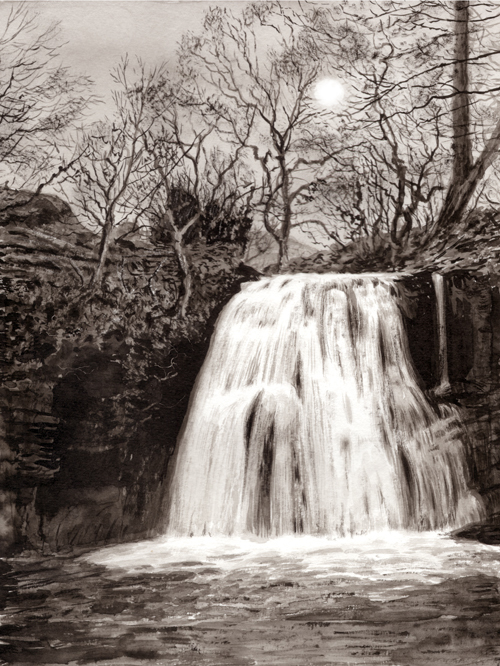 This Yorkshire Dale was chosen as the first Emmerdale in the original TV series, it was also William Wordsworth's 'Ammerdale' and where Charles Kingsley wrote part of his book The Water Babies when he stayed at Bridge House in the village of Arncliffe. 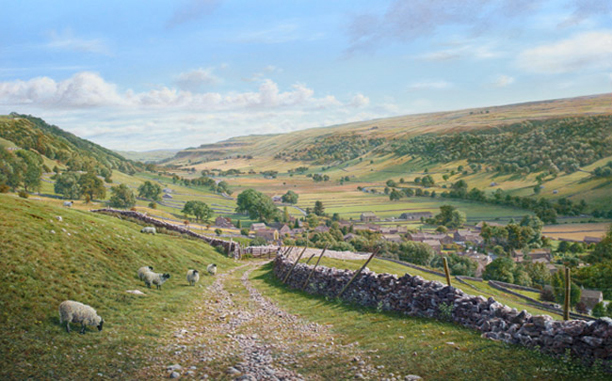 The village of Halton Gill is viewed in this painting from the start of Horse Head Pass at the head of the dale. The track of Horse Head Pass starts at Halton Gill in Littondale and goes over the fell to Raisgill and Yokenthwaite in Langstrothdale. Pen-y-ghent and its close neighbour Plover Hill are seen from an unusual angle, giving Pen-y-ghent an appearance more akin to Ingleborough. 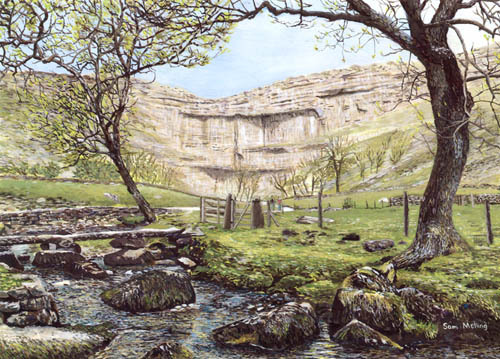 Horton-in-Ribblesdale is a great centre for walkers; it is the start and finish of the gruelling Three Peaks Walk, where Penyghent, Ingleborough and Whernside are bagged in a single day. 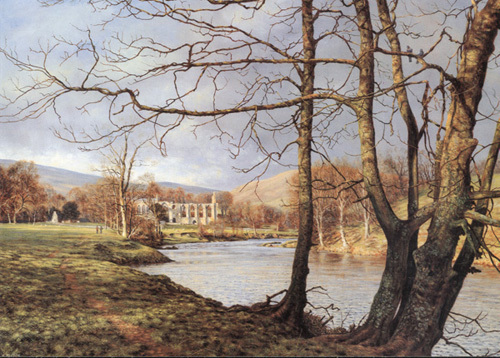 However, the area has much more to offer than rugged fell wandering, with riverside strolls such as here in this painting. 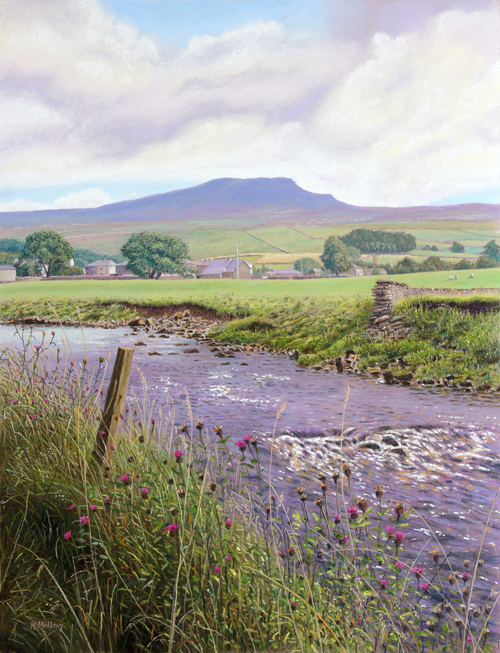 The view is from the west bank of the Ribble, looking across to Horton and the iconic Pen-y-ghent... 'Hill of the wind'. 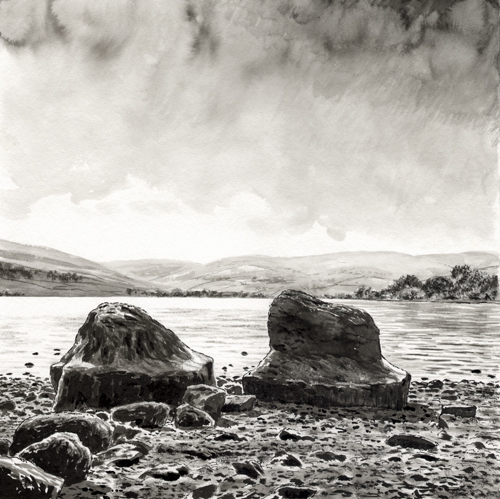 A more contemporary treatment of this subject sees Malham Tarn from a distance nestling in its hollow. 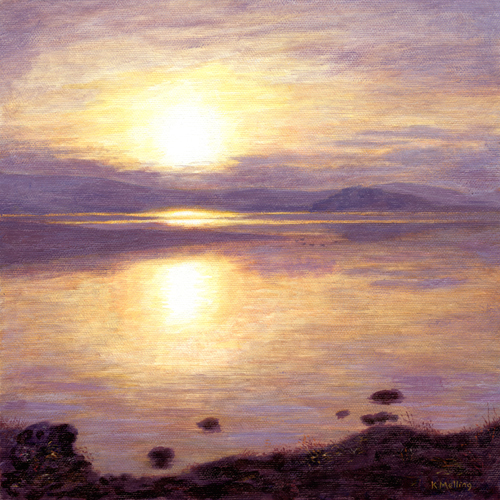 Malham Tarn is one of only two natural lakes in the Yorkshire Dales, the other being Semerwater. The base and shaft is all that remains of the old Nappa Cross, it has been moved and built on top of a nearby wall. The original painting was done on three separate canvasses. 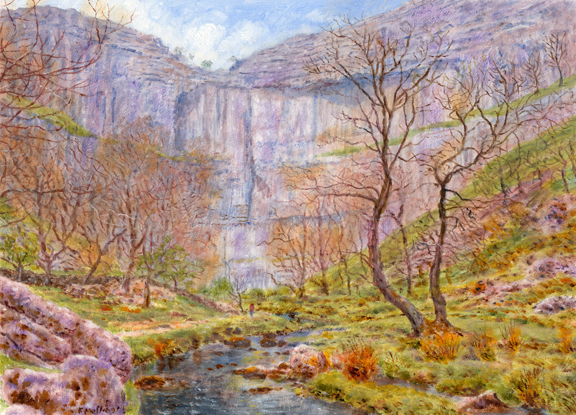 Together with Gordale Scar, this spectacular limestone feature is responsible for attracting many visitors to Malham. 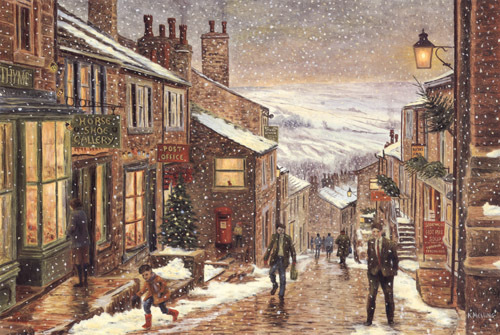 Looking down the steep cobbled main street of Haworth - famous for its Brontë associations. Haworth is not really in the Dales but is not too far away. 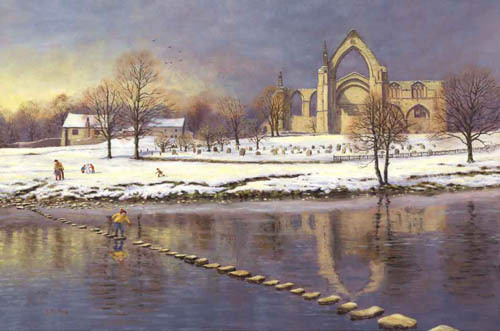 This Yorkshire Dales painting focuses as much on the stepping stones as on the Priory ruin, a great source of fun. Giclee print. 10.75 x 14in. 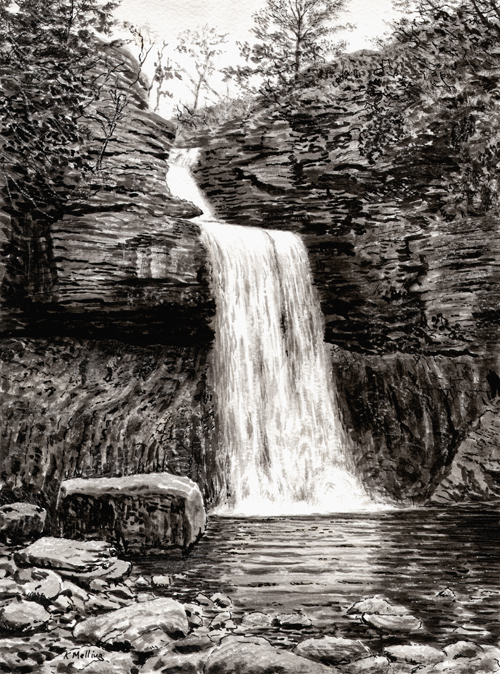 The walk from the Hill Inn, Chapel le Dale to Ingleborough is full of interest, passing pot holes, limestone pavements and other fascinating features and is probably the shortest way to the summit. 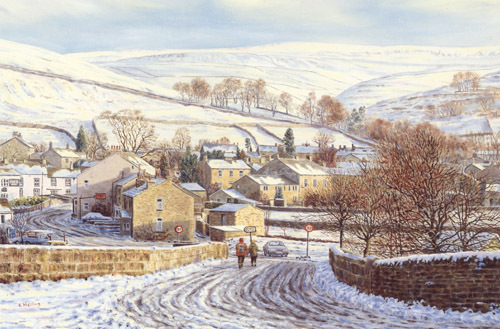 Surrounded by fells, this typical Yorkshire Dales village maybe gets more than its fair share of snow. Seen here from the bridge over the River Wharfe, the low winter sun throws the cottages into greater relief and picks out details on Great Whernside in the background. Viewed from Pecket Well with The woodlands of Hard Castle Crags in the valley below to the right and Hebden Bridge down to the left. Quite a dramatic blustery day on the summit ridge of Penyghent (properly Pen-y-Ghent) . 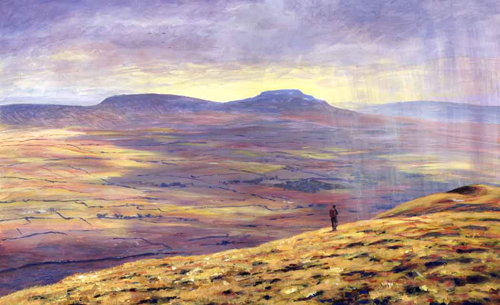 Penyghent is the smallest of the Three Peaks, yet its pleasing shape has a huge presence. 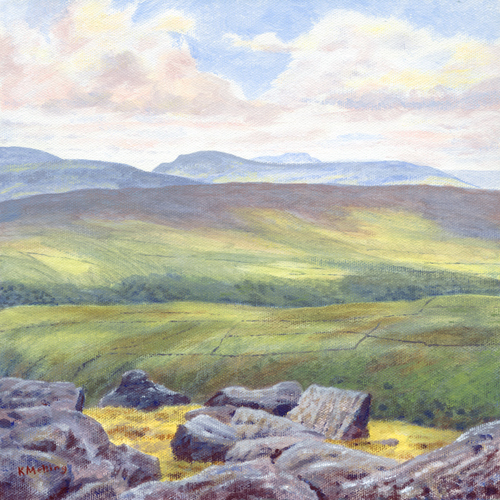 Pendle Hill is seen easily from many of Yorkshire's hills in the the western and southern Dales. 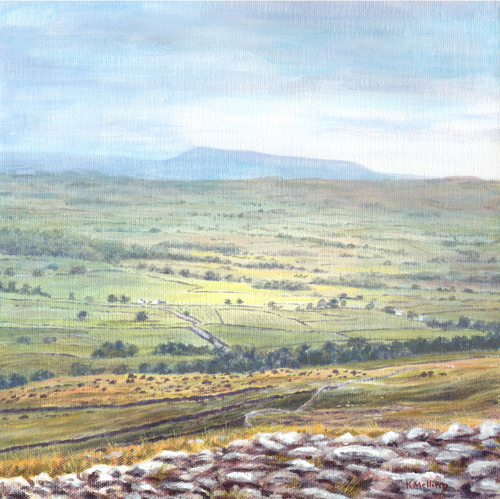 This view is from the edge of the limestone pavements on Norber near Austwick. 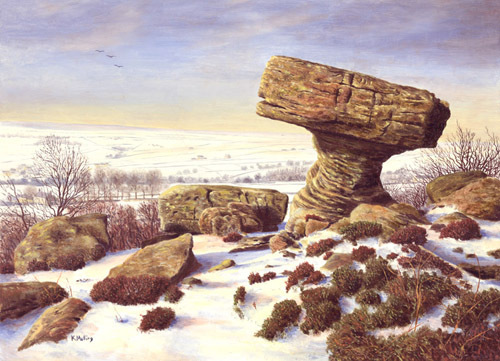 Norber is famous for its field of erratic boulders which can be seen in this painting dotted on the lower slopes. On Horse Head Pass (the track between Halton Gill and Yokenthwaite) looking back to Fountains Fell and the steep narrow road up to the hanging valley of Silverdale (back o' Pen-y ghent). On the summit ridge of whernside, the highest of the Three Peaks, looking over the valley of Chapel- le-Dale to Ingleborough. 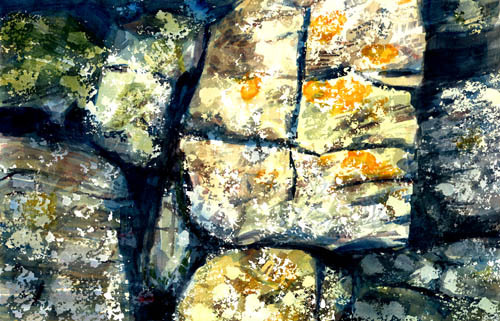 The Yorkshire Dales are criss-crossed by a maze of drystone walls. This painting zooms in on a specific detail which makes an interesting abstract composition (I hope). 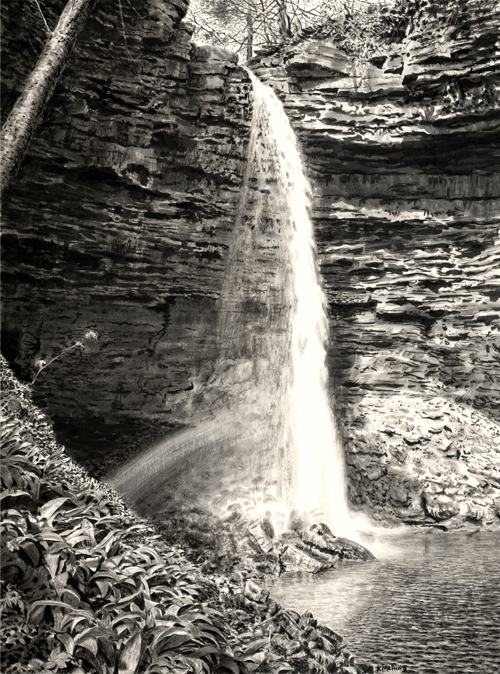 Shown here are the Upper Falls as viewed from the bridge. Semerwater is one of only two natural lakes in the Yorkshire Dales. The other is Malham Tarn. 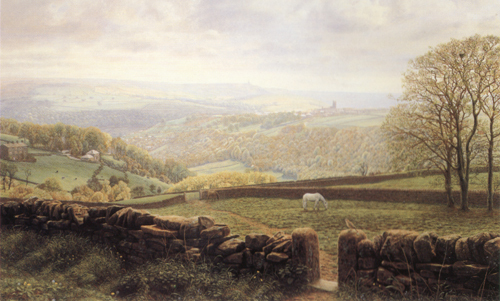 The view here looking across the valley of Chapel-le-Dale from near Twisleton Farm is just a narrow slice of what is actually visible. 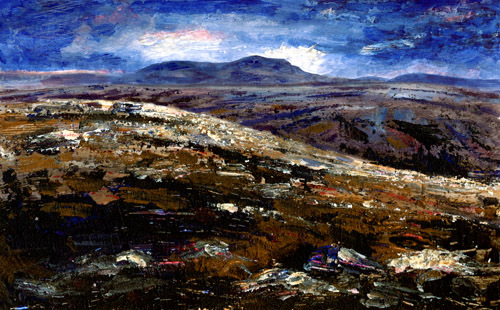 ''The Big Blue Hill'' rearing up above Raven Scar makes an unusual vertical image of this subject. 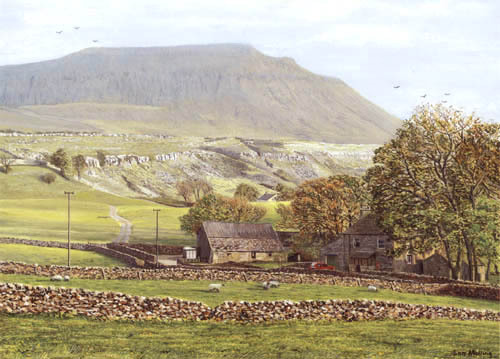 Of the Yorkshire Dales Three Peaks, Ingleborough is probably the most climbed. Signed Limited Edition of 195. Viewed from near the summit of Whernside, the massive Ribblehead viaduct, hardly makes an impression: it appears as a small squiggle, a mere punctuation mark in natures immensity. 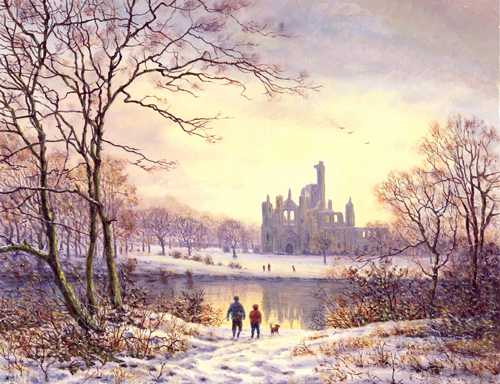 Two snow scenes of Kirkstall Abbey may seem a little odd when there are many other Yorkshire abbeys to paint. 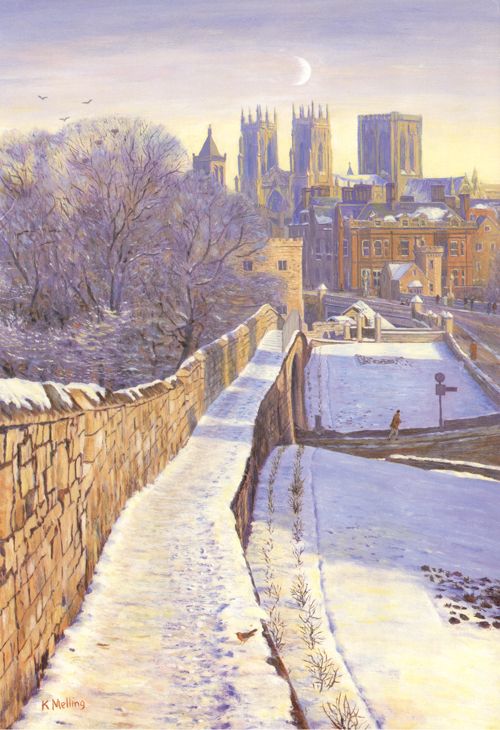 The truth is - they were commissioned as personalised charity Christmas cards on consecutive years - the first one (this) did so well that the card company wanted another. 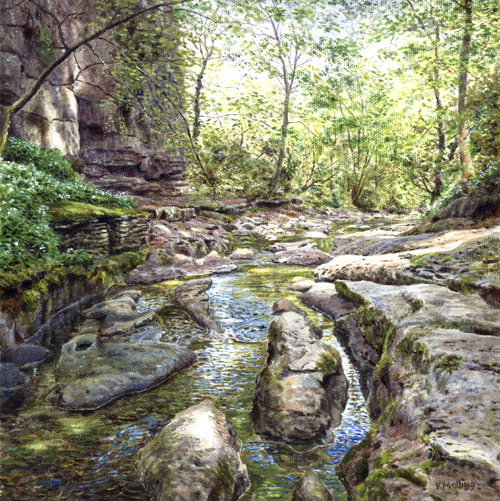 Hardraw Force is privately owned, but is open for the public to visit on payment of a small fee at the Green Dragon pub at Hardraw. Not really in the Yorkshire Dales, Kirkstall Abbey is near Headingly in Leeds - but the River Aire does begin life in Malhamdale. 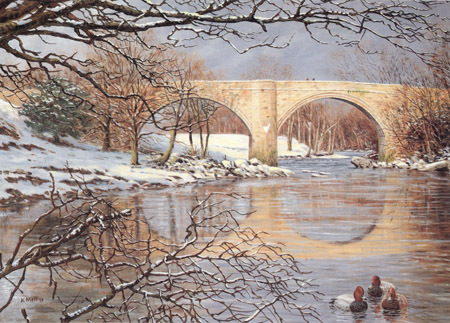 Kirkby Lonsdale is in Cumbria, but has strong connections with the Dales mainly because of its closeness to the Yorkshire border. Lots of amazing rocks are spread over this site, managed by the National Trust. 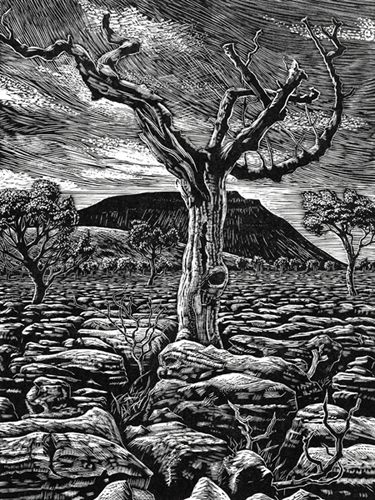 This is a giclée print of the 1st state of a wood engraving. 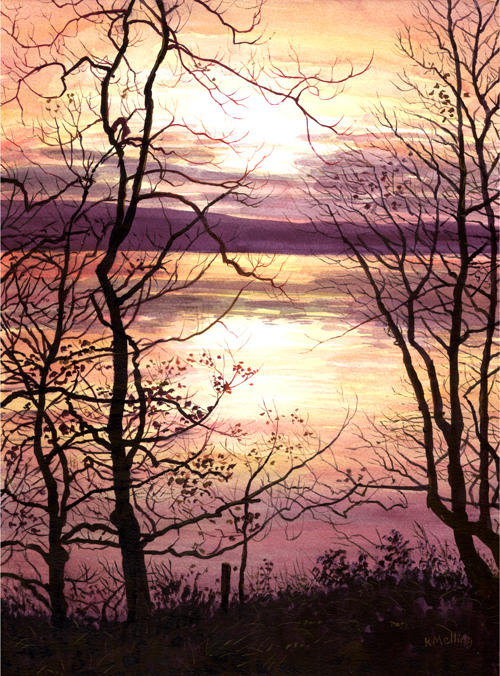 The final wood engraving had more cut out of the sky, but I prefer the version here. 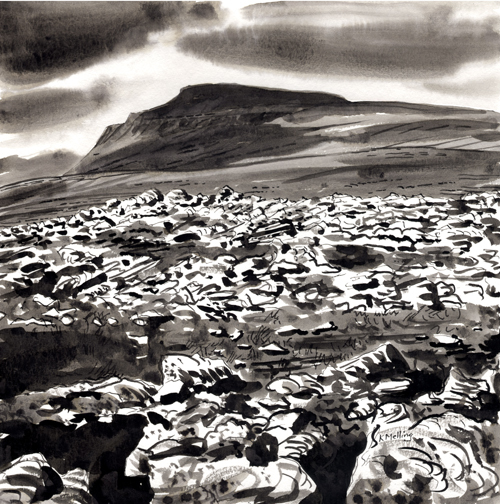 The dramatic views of Ingleborough from the limestone pavements above Chapel-le-Dale always intrigue me.